Nearly 1.2 billion people are living below the extreme poverty line on less than $1.25 USD per day. Unfortunately, many of these individuals do not meet the qualifications of many poverty alleviation programs or are too consumed with meeting basic needs to apply for such programs. In partnership with the Ford Foundation, the Consultative Group to Assist the Poor (CGAP) set up ten pilot programs in eight countries (Ethiopia, Ghana, Haiti, Honduras, India, Pakistan, Peru and Yemen) to test and observe the “graduation approach” to poverty alleviation developed by the Bangladesh Rural Advancement Committee (BRAC). The graduation approach identifies individuals living in extreme poverty and provides them with basic resources, financial education, technical training, life skill coaching, and social support so that they can “graduate” from the program with food security and sustainable sources of income. In September 2014, CGAP conducted evaluations of six programs that used the graduation approach. These evaluations were used to produce a detailed report that could serve as a technical manual for future programming. With the possible exception of the Honduran program, Mejoramiento Integral de la Familia Rural, five out of the six programs evaluated by CGAP had measurably increased their participants’ income, assets, food security, health, and happiness. While CGAP’s evaluation supported the effectiveness of the graduation approach, it also identified some of the barriers to graduation. In order to achieve a truly sustainable income, participants needed to diversify their assets and income sources. This was particularly clear in Honduras where 83 percent of program participants had purchased chickens as a long-term investment. Unfortunately, many of these chickens contracted illnesses and died, plunging their owners back into poverty. Since illnesses and other acts of nature are often unavoidable, diversification of long term assets is essential. Ultimately, the evaluations performed by CGAP and the Ford Foundation showed significant improvements for program participants. According to CGAP, pooled estimates of program participants’ per capita consumption increased 5.8 percent. In a true test of the graduation approach, per capita consumption continued to increase even after program support ended. The evaluations also revealed that participating families experienced fewer days in which a member of the household skipped meals or went a whole day without food. Finally, CGAP noted that the graduation approach had significantly and persistently increased household assets, improved psychosocial wellbeing, and increased self-employment income. By February 2016, 40 new programs had adopted the graduation approach. The success of the ten pilot programs established by CGAP and the Ford Foundation illustrated the efficacy of the graduation approach and ensured its use for decades to come. Last month, representatives at the United Nations Third International Conference on Financing for Development agreed to a number of proposals to fund the upcoming Sustainable Development Goals. Collectively known as the Addis Ababa Action Agenda, these proposals cover a range of financing sources, from domestic tax revenues and official development assistance to private sector financing and philanthropy. 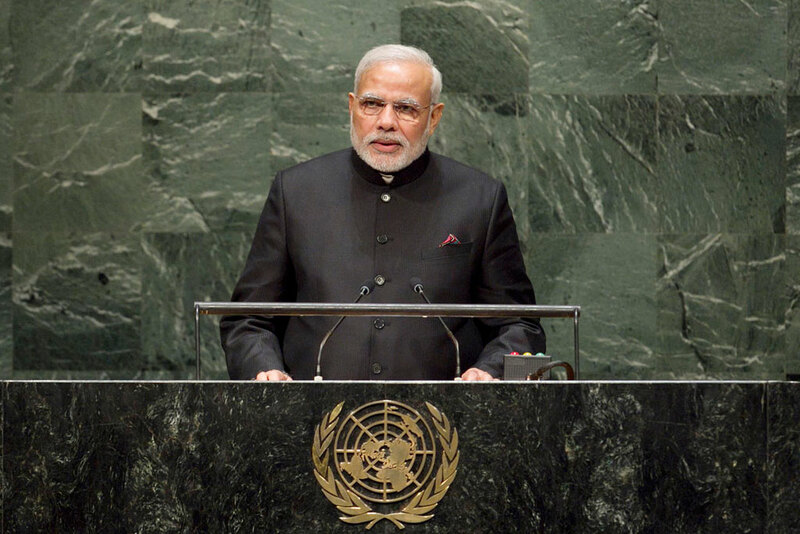 The Agenda also included measures to support international trade and capacity building. 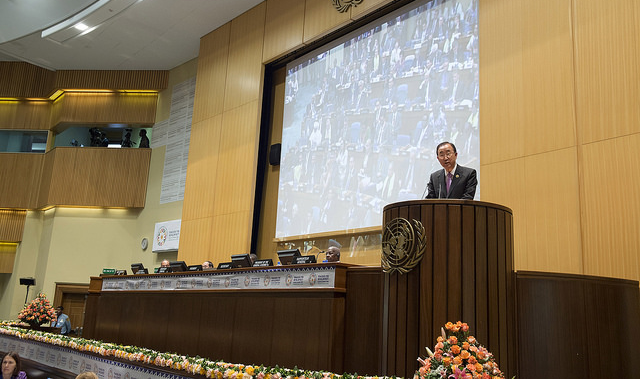 World leaders now hope that the financing mechanisms laid out in the AAAA will encourage countries to adopt both the SDGs and a climate change accord scheduled for negotiation in Paris this December. The SDGs are a proposed set of 17 goals that are meant to provide benchmarks for a variety of development issues over the next 15 years. The goals cover poverty, hunger, health, education, gender equality, energy, the environment, and a host of other global challenges. Each goal is accompanied by a number of targets that serve as tangible metrics of a country’s progress towards the SDGs. These new goals are a follow up to the Millennium Development Goals, a 15-year set of eight benchmarks that world leaders agreed to back in 2000. To improve their drafting process for the new goals, the UN organized the largest consultation program in its history that combined government input with surveys of the general public. The Addis Ababa Action Agenda, a vital part of the new development goal drafting process, is a step towards recognizing the role of international philanthropy and the private sector in supporting global development. The agreement makes several references to the importance of the private sector in economic growth, particularly the role of the financial sector in enabling small businesses. Furthermore, Article 10 of the agreement explicitly lists philanthropies and foundations as vital members of the “global partnerships” that are required to meet the SDGs. This is a substantial improvement over the funding section of the MDGs, which overwhelmingly relied on official development assistance and did not reference to international philanthropy. Though these suggestions were not explicitly included in the Addis Ababa Action Agenda, countries looking for ways to finance their SDG efforts should still consider them. Many of these suggestions simply entail engaging with the private and philanthropic sectors, and collecting new data. However, some countries may balk at evaluating their legal environments. A major finding of the CGP’s new Index of Philanthropic Freedom is that laws created to serve the legitimate interests of the state, such as capital controls and illicit financial flows legislation, often hinder philanthropic efforts as well. Examining their legal requirements will require states to evaluate the benefits of combating illicit finance or managing volatile financial flows against the benefits that come from international philanthropy. As Dr. Adelman noted in her comments, 80% of the developed world’s economic engagement with the developing world comes from the private sector, philanthropy, and remittances. The Addis Ababa Action Agenda is an important first step in acknowledging these essential flows and how they can help meet the SDGs. But the international community needs to go further in developing a more holistic funding plan for the SDGs, and the recommendations made at the Conference on Policy Coherence are an excellent place to start. In the near future, the countries of the Gulf Cooperation Council (Saudi Arabia, the United Arab Emirates, Qatar, Kuwait, Bahrain, and Oman) could become a new and influential new source of international philanthropic activity. In all of these countries, a strong culture of giving exists alongside rapidly expanding wealth. Some of the GCC’s most affluent citizens are already realizing this philanthropic potential. But in order for all segments of these societies to effectively engage in philanthropy, the governments of the GCC need to create a more conducive environment for giving. The Islamic tradition of philanthropy provides a strong foundation for such an environment. Zakat, one of the five pillars of Islam, requires Muslims to give 2.5% of their annual income to charitable causes. Sadaqa, voluntary giving above the level of Zakat, is also considered one of the foremost virtues in Islam. The influence of these religious practices on giving is reflected in the data, which estimates that Muslims worldwide give between $200 billion and $1 trillion in Zakat and Sadaqa annually, though most of this money is given locally through unofficial channels. The six countries of the GCC account for a substantial share of this giving, and as they continue to grow wealthy through oil, their impact on global philanthropy could also grow accordingly. Among political and business elites, the GCC already gives on a level comparable to the elites of similarly sized developed nations. In 2013, donations of over $1 million in the GCC totaled $1.84 billion, compared to $2.24 billion from the United Kingdom. Furthermore, most of these philanthropic activities are international in nature, with $1.75 billion of these large donations going to overseas charities. Although the GCC still lags behind developed nations in the number of donations per capita over $1million, wealthy citizens of the GCC clearly don’t face significant restraints to their charitable giving. 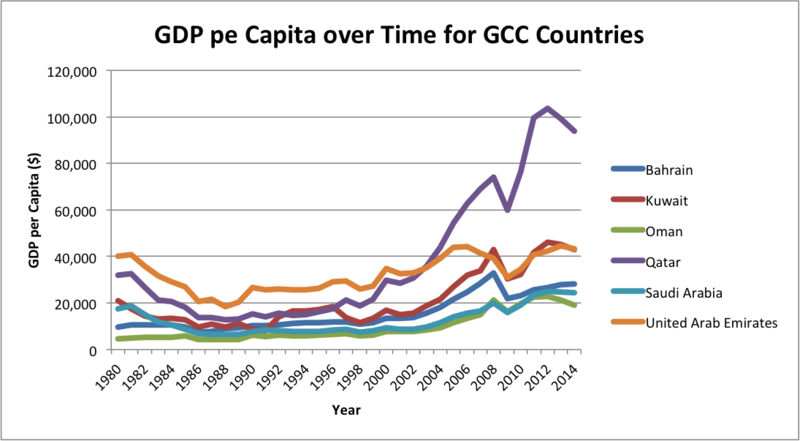 But the real potential for philanthropic growth comes from the growing middle class of the GCC countries. Although there is no data on philanthropic flows for each country, economic data suggests a huge potential for middle class giving. According to the IMF, Qatar, the UAE, Kuwait, Bahrain, Saudi Arabia, and Oman all have per capita GDPs comparable to those of countries in the OECD’s Development Assistance Committee. Yet philanthropic data would probably show that the countries of the GCC lag behind the DAC in terms of international giving, largely due to the governmental obstacles to philanthropy that non-elites face. The Center for Global Prosperity recently surveyed the giving environments in Saudi Arabia and Qatar as part of its new Index of Philanthropic Freedom. Of the sixty-four countries surveyed for the index, none scored lower than Saudi Arabia and Qatar, ranking 64th and 63rd respectively. In both countries, and most likely in the other countries of the GCC, civil society organizations face an intimidating legal environment, in which government regulators have complete authority to shut down any CSO they view as subversive. 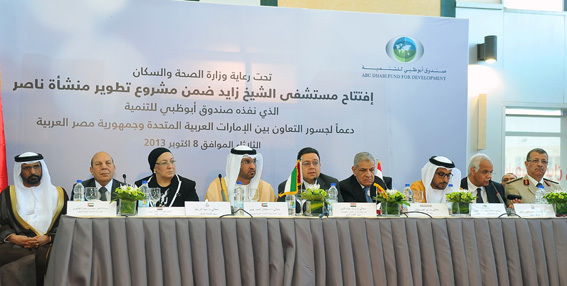 CSOs are a primary destination for donations from middle class citizens looking to give, and so environments like those in Saudi Arabia and Qatar diminish the giving potential of these citizens. The philanthropic potential of the GCC should not be underestimated. These six countries have the resources to make a significant humanitarian impact, thanks to their growing wealth and charitable culture. However, while the wealthiest citizens in the GCC are already supporting philanthropy with billions of dollars in donations, the rest of the region’s citizens need their governments to provide better support for the development of CSOs before they can give with the same freedom as those at the top. Developing countries are often characterized by deficiencies in institutional security, infrastructure, and market openness. Among such emerging states, Landlocked Developing Countries (LLDCs) are set apart by their lack of direct access to the world’s oceans and seas. While landlocked European nations are on average 170 km away from the nearest port, their LLDC peers average nearly 1,370 km, placing them at a distinct disadvantage. The inability to access maritime transportation networks creates additional burdens that most developing countries do not have to face, including additional border crossings and significantly higher costs of doing business and transporting goods. These priorities may be boiled down into two major issues that need to be addressed vis-à-vis development in LLDCs: transportation infrastructure and trade relations between bordering countries. While efficient and reliable transportation and logistics are important issues in all nations, they are essential in LLDCs. 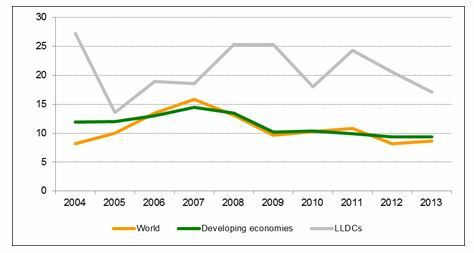 To date, only nine LLDCs have more than 50% of their roads paved. Recent research conducted by Paras Kharel (of the South Asia Watch on Trade, Economics & Environment) and Anil Belbase (of the Institute for Policy Research and Development) used data from the World Bank’s Logistics Performance Index (LPI) to determine the correlation between LLDC logistics performance and exports. The LPI is determined on a scale of 1 to 5 “based on efficiency of customs clearance process, quality of trade- and transport-related infrastructure, ease of arranging competitively priced shipments, quality of logistics services, ability to track and trace consignments, and frequency with which shipments reach the consignee within the scheduled time.” Kharel and Belbase discovered that, all else being equal, a 1% increase in the LPI performance of LLDCs is associated with an average increase of exports by 2.84% – 3.27%. 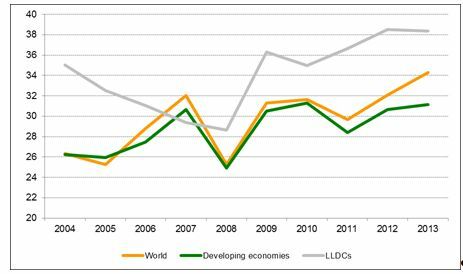 Similarly, a 1% increase on the LPI in transit nations (nations that lie between LLDCs and port access) is associated with a 1.1% – 1.2% average increase in LLDC exports, all else being equal. However, if LLDCs do not share positive relations with their neighbors, a relatively high LPI score is essentially meaningless. A common thread between many LLDCs is a lack of positive diplomatic relationships with major neighbors. Ethiopia’s relationships with Eritrea and Somalia, for example, are frosty at best. Newly minted South Sudan shares most of its border with other landlocked nations and Sudan, from which it declared independence in 2011 after a long, bloody conflict. For meaningful and sustained development, improving relationships with border nations is essential in order to allow and obtain greater access to the world’s ports—and by extension the world’s markets. Many LLDCs, such as Tajikistan and Uzbekistan, must use routes that go through more than one transit nation to reach a port. Encouraging trade agreements that knock down tariffs and nontariff barriers should be a priority. The private sector and civil society can also play major roles in the process of developing LLDCs. Civil society and the private sector can help provide more intimate perspectives of ordinary people who live in LLDCs which can lead to more specific and productive policy recommendations tailored to each nation’s unique needs. Civil Society can also advocate for streamlining procedures and eliminating barriers in order to promote more robust FDI, an important cog in LLDC development. The UN Conference on Trade and Development reported that FDI is significantly more important for GDP growth and capital formation than in developing countries as a whole. As logistics performance, diplomatic relations with immediate neighbors, and engagement with the private sector and civil society improves, LLDCs will be enabled to overcome the unique barriers to development that they face. The first week of August marked the inaugural U.S.-Africa Leaders Summit, a meeting of nearly 50 African leaders and American businessmen in Washington, D.C. Though taking place nearly six years after President Obama’s first inauguration, the Summit manifested the President’s longstanding interest in stronger U.S.-Africa ties. During his time in the Oval Office, however, President Obama has often been criticized for his lack of serious involvement in Africa. At the tail end of the Obama Administration, the Leadership Summit briefly silenced critics who claimed the President Obama has ignored Africa. The Summit, the first meeting of its kind, was an opportunity for African leaders, most of whom are heads of state, to convene in one place with a sitting American president. After 3 days, the Summit unveiled its greatest initiative: a $33 billion investment plan to catalyze economic activity on the continent. Unlike previous financial flows to Africa, the Summit’s investment plan is a departure from traditional Official Development Assistance (ODA), usually in the form of bilateral loans. Instead, the investment plan is set to take three forms: $7 billion to encourage trade and investment in Africa, $14 billion from American multi-national corporations (MNC), and the remaining $12 billion for infrastructure development through the USAID Power Africa initiative. The investment package is designed not only to reduce poverty across the continent but also to encourage investment beyond Africa’s primary resources. As such, the investment package may signal a swing of the economic development pendulum from aid to trade. This marked shift, though a step in the right direction, is only a step. In comparison to the United States’ previous financial flows to Africa, $33 billion is small. In 2013 alone, the U.S. imported $39.3 billion from Africa and exported $24 billion to the continent. 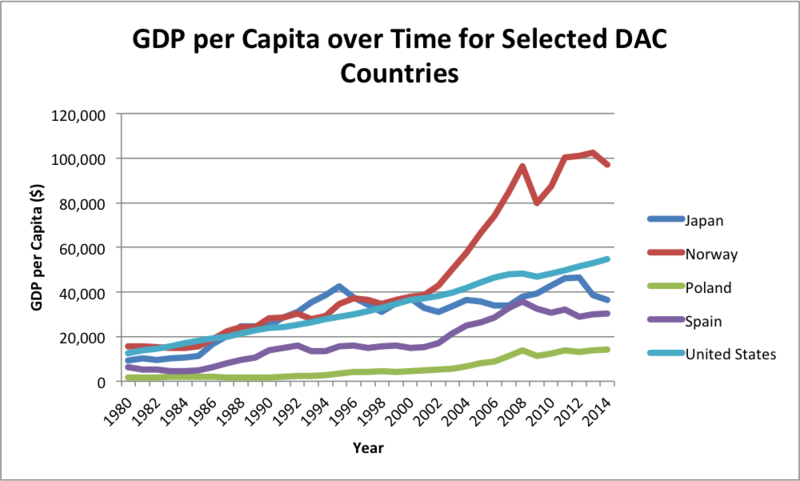 Outside of trade, ODA claimed nearly $7 billion to the continent in the same time period. Despite comparatively meager figures, the forthcoming investments could embody a new trend in development assistance for Africa. By shirking traditional bilateral loans, the new investments emphasize the importance of private sector activity rather than corrupt governments. Only a few countries will benefit from the package’s key investments. The Power Africa Initiative’s newest investment will only benefit six countries, meaning that each country will receive $2.4 billion over the course of five years. While not a small number, the Power Africa investment will close a small section of the continent’s infrastructure gap, worth an estimated $38 billion annually for the next decade. 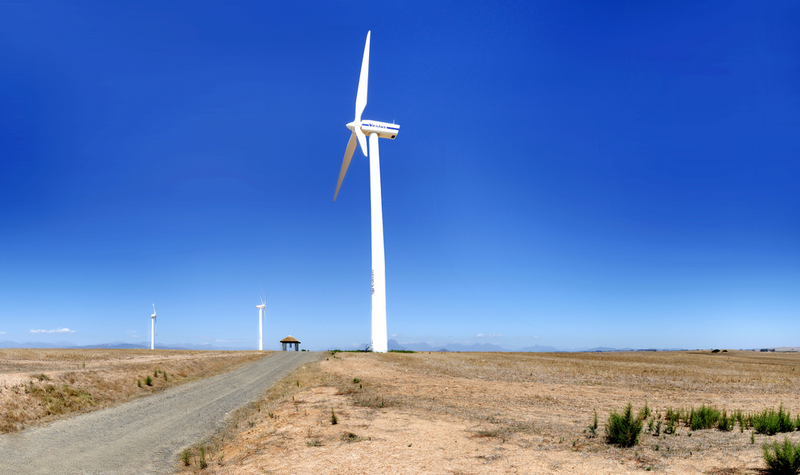 Some critics are further puzzled by the initiative’s strategy of distributing the money for various projects such as mini-grid and off-grid expansion throughout six counties (Ethiopia, Ghana, Kenya, Nigeria, Tanzania, and Liberia) when it could make a greater impact by devoting the money to one project. The Grand Inga Dam, the Trans-African Highway, and the Lesotho Highlands Water Project are all far-reaching projects aimed at improving infrastructure beyond a limited geographic area. Instead of distributing funds to six countries, Power Africa could focus its invest in one of the aforementioned projects, and perhaps even further reduce the Infrastructure Gap. Additionally, MNC investment is unlikely to go to the continent’s poorest countries. One of the investment package’s most notable companies Coca-Cola already has offices is Kenya, Nigeria, and South Africa, making it more likely that these countries will receive greater investments. Targeted investment, however, might not be such a bad thing. Countries likely to receive the majority of the investments are those with more stable governments and more trade-friendly economic policies. If anything, investments toward these countries could incentivize countries to improve their own investment climates. Perhaps the most prominent of the criticisms of the investment package is that these efforts are too small and too late for lasting impact. Such criticism is well-taken, but the U.S.-Africa Leaders Summit’s investment plan could signal a transition for further U.S.-Africa investments. Unlike traditional ODA, the Summit’s forthcoming investment recognizes the African continent as a legitimate investment location, corresponding to the continent’s impressive GDP growth rate. The Obama Administration cites Africa’s 5.4% growth rate as a promising sign of Africa’s investment potential. With the upcoming investments, the African continent can sustain an upward growth trend. Though the dust has settled on the U.S.-Africa Leaders Summit, the investment’s real work, still lies ahead. Like fashion, international development is guided by trends. While some trends come and go, others withstand the test of time. If recent events are any indication, a new international development trend is on the horizon: development banks, governed by developing countries. Just before the Asia-Pacific Economic Conference in Bali last October, China announced the establishment of the Asian Infrastructure Investment Bank (AIIB). As its name suggests, the bank will devote its resources to finance national and regional infrastructure development projects throughout Asia. Startup capital for the new bank is expected to be $50 billion, with aspirations to match. One of the new bank’s notable plans is constructing a railway from Beijing to Baghdad. Though ambitious, China is willing to devote its resources to the cause. According to the McKinsey Global Institute, China spent 8.5% of its GDP on infrastructure from 1992 to 2011, more than any other country in the world. While plans for the AIIB are still underway, Brazil, Russia, India, China, and South Africa (BRICS) recently announced plans for their own bank. Like the AIIB, the New Development Bank (NDB) will finance infrastructure projects, with initial assets reaching $50 billion. An additional $100 billion will be designated for the Contingency Reserve Arrangement (CRA) for member states with suffering from severe current account deficits. Unlike the general infrastructure fund, to which all member states contributed equally, the CRA is dominated by Chinese assets. Of the $100 billion, the Chinese will contribute $41 billion with South Africa contributing $5 billion and Russia, Brazil, and India each contributing $18 billion. With the CRA, the NDB could prove a viable alternative to the IMF, and likely with fewer conditions. In less than a year, two new development banks have taken root. Does this trend have staying power? If anything, the new banks will remind the development community of the importance of infrastructure development. However, to be successful, the banks’ leaders must have realistic expectations with respect to international cooperation and lending capacity. The AIIB and NDB challenge the structure of current global development institutions. The Bretton Woods system, created in 1944, reflects the economic structure of a bygone era in which the BRICS had not yet emerged. Decades later, the economy has changed though voting structure has not. 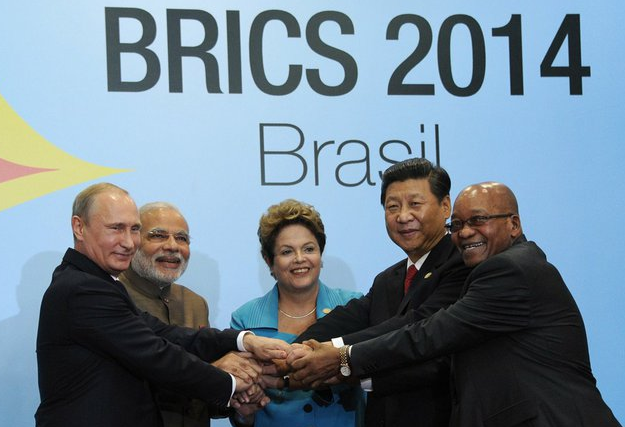 The BRICS hold only 11% of the votes in the IMF, though their economies claim 20% of the world economy. A 2010 IMF agreement will redistribute some of the votes to give more weight to developing countries, thereby reducing the importance of financial contributions. The agreement, however still awaits ratification from the U.S. Congress. Until then, China, poised to be the world’s largest economy this year, will have fewer votes than Belgium, Netherlands, and Luxembourg combined. The World Bank estimates a $1 trillion infrastructure gap for low- and middle-income countries, and the AIIB and the NDB could help to close the gap through their own financial contributions, a collective $200 billion. Cooperation with preexisting institutions, however, could be more complicated. Though sizeable, the initial capital of the AIIB and the NDB is much smaller compared to the World Bank or even the Asian Development Bank, with $232 billion and $165 billion, respectively. Cooperating with the World Bank, Asian Development Bank, and other institutions could mean that priority projects for both banks are deferred due to the financial might of its development predecessors. To be a serious alternative to preexisting institutions, both AIIB and NDB must raise additional capital. Perhaps the most notable shortcoming is both banks’ lack of involvement in any African country save for South Africa. According to the World Bank, approximately 70% of people in sub-Saharan Africa live without access to electricity. It is puzzling as to why other African countries are given the cold shoulder, particularly Nigeria and its 170 million people, the largest in Africa. Coupled with increasing GDP growth and decreasing inflation, the country is Africa’s second largest economy, and is expected to be one of the world’s top economies by 2030. China is Africa’s largest trading partner, though the country’s trade with the continent is only a 5% share of China’s global trade. Given that Africa has some of the world’s most pressing infrastructure needs, Africa’s lack of inclusion is questionable at best. Both banks must exercise caution in their financial management and project execution. In plans for both banks, China is set to be a chief financial contributor, however the country remains a top beneficiary of World Bank funds. China, along with Brazil and India owe a collective $66 billion in outstanding loans. 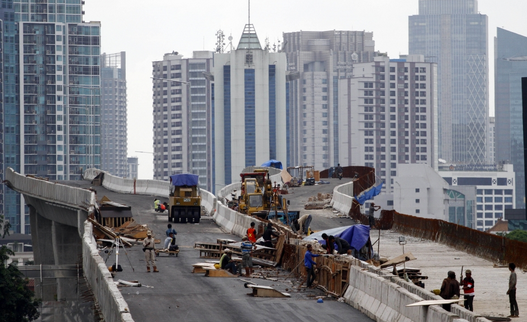 Additionally, both banks must remain cognizant of the impact of infrastructure in the least developed areas. In a 2013 Center for Economic Performance paper, economist Ben Faber found that small countries with only recently connected highway systems experienced GDP growth that was on average 19% less than small countries unconnected to highway systems. This was due to the inflow of inexpensive goods that replaced demand for local goods. While the benefits of infrastructure are numerous, it is by no means a poverty-eradicating panacea. But it is very helpful. Increased productivity and competition make infrastructure investment key driver of economic growth and a lasting trend. Do development banks governed by developing countries have lasting power? Only time- and perhaps the international community- will tell.